Achieve professional quality chroma key & green screen hanging results using our matte colored, seamless, 100% Fabric Greenscreen Cloth Backgrounds kit which are heavy duty, non reflect & generously sized. NOTEM - Frame/stand system Not Included! - Original backdrop with 6 x 9 ft size (2 m x 2.8 m) - Size that's ideal for photographers: shoot portraits, product photography, interview videos photoshoot, shooting youtube movie, digital streaming twitch cinema, work with props . ORDER NOW & Get this Incredible Green Screen Muslin Backdrop to Stay ahead of the Competition! 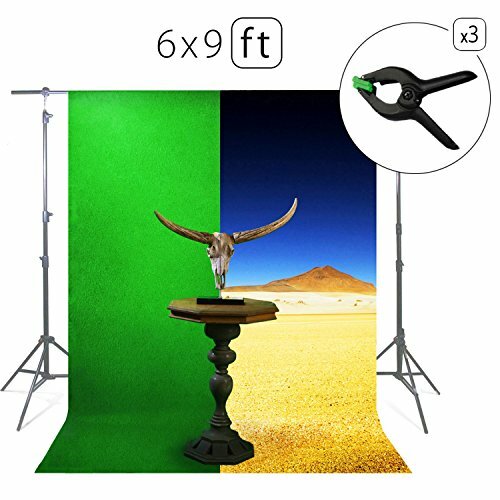 PROFESSIONAL QUALITY GREEN SCREEN 6x9 Ft - Make use of Chromakey like a pro & swap backgrounds effortlessly - be it videos or still photography ! MUVR Lab Backdrops set offer premium quality & cost-effective solution to help achieve a clean key ! UNBEATABLE DEAL - Besides best quality & lot of bonus you also get 100% Risk-Free Satisfaction Guarantee to let you buy with confidence, making these the best photoshoot backdrops for photography or video film production ! If you have any questions about this product by MUVR lab, contact us by completing and submitting the form below. If you are looking for a specif part number, please include it with your message.